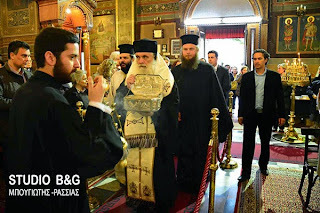 She related to me with awe and shyness that last Monday, the morning of the 24th of March, she venerated the Sacred Relics of Saint Luke the Physician in a church in Nafplio and also received a little oil from the vigil lamp of the Saint. At noon along with her 12 year old son A., after the [Greek Independence Day] celebrations at school were completed, they went to the Super Market. The mother hastily shut the back door of the car and by mistake the fingers of her son got stuck between the door and the body of the car. She did not understand what happened and when she got to the front she took off, and for the next 30 seconds the child was shocked and in pain and in a low voice yelled for his mother without being able to articulate a single word. As soon as the mother realized what was happening, she immediately stopped, went to the back, and hopelessly opening the well-shut door, she saw surprisingly the fingers of the child as if undisturbed despite the fact they had received all that pressure! Great are the miracles of Saint Luke the Physician, since he has done other similar miracles (see the miracle for the young pianist Nazar) to those who have called upon him.